Byrne Robotics: The First Black Superhero at The Movies? I have seen a meme going around that challenges the assertion that "The Black Panther" movie will be the first black superhero film. Naturally, it is not. But the meme suggests, wrongly, that "Blade" (1998) was the first. 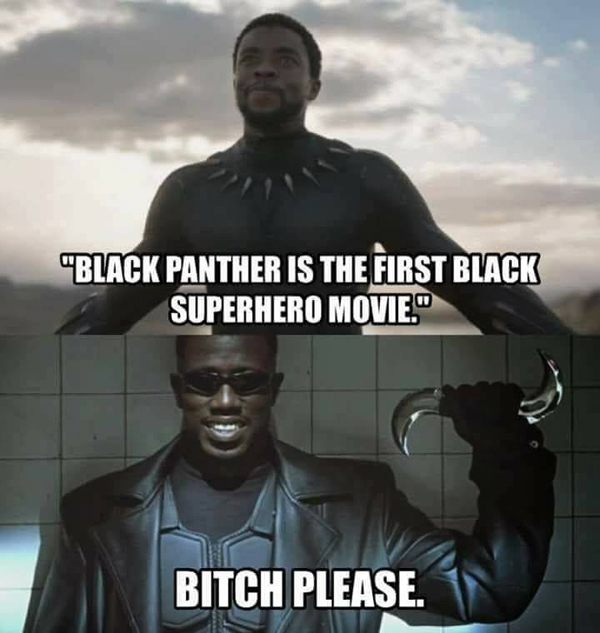 If the meme made a distinction about it being Marvel's first black superhero movie, it might have something, but the meme does not make that distinction. So, who is the first black superhero to head a feature theatrical film? "Steel" (1997) came before "Blade", if we are talking more or less serious action movies. "Spawn" (1997) was released that same year. Do we include comedies? If that is the case, there was "Blankman" (1994) with Damon Wayans, and before him there was "The Meteor Man" (1993) with Robert Townsend. Now "Blade" does beat "Hancock" (2008), but "Hancock" beats "The Black Panther" to the punch, as does Halle Berry's turn as "Catwoman" (2004). What the "Black Panther" movie will be is the first big budget, mainstream black superhero movie. I believe that "Blade" does deserve a lot of credit in that it was the first major release superhero film after "Batman and Robin" and its' success helped get "X-Men" made. After "Batman and Robin"'s disappointing box office and critical reception studios were leery about going ahead with comic book properties as film franchises. "Blade" came along and showed that if done more correctly, comic book movies still had some life in them. Of course, "X-Men" (2000) was a success, as well, and it and "Blade," along with "Spider-Man" (2002) started off the new era of superhero films. "The Black Panther" is a big thing, though, as it is the biggest budgeted, most mainstream (considering the Catwoman film was not considered related to the "Batman" movies) film to feature a black superhero, with a prominently black cast. It looks to be awesome, and I hope it is a huge success allowing for more diverse superheroes from the comics to get the big screen treatment. Are there any other movies with black superheroes I am missing? What are your thoughts about these films? Shaft is not a superhero, unless we are using a relaxed definition whereby any action film hero is "super" because they do things a normal human can't. Are there any other movies with black superheroes I am missing? Invisible Boy in Mystery Men (1999) but obviously not a solo film. Yeah, I am talking about lead roles. That's why I didn't mention Storm or the Falcon. How do you define "big budget movie" ? Doug, I mentioned Blankman in my first post. Meteor Man, whom I also mentioned, beats him by a year. How'd I miss that sentence? I went from Spawn to Hancock. The first Black silver screen superhero of any true relevance has to be Blade. I wouldn't mind seeing another Blade movie starring Snipes. And I think it also depends on the time it was produced. Today's 50 million budget is not the same as 50 millions in the seventies. Does Captain EO (1986) as played by Michael Jackson count? Matthew W, good question about Captain EO. What does everyone else think? Captain EO was only shown in the Disney parks and was about 15 minutes in length. More of a short than a "big budget movie", IMO. With that said, The Meteor Man definitely is the first. The first adapted from another source would be Steel. I'm not sure Captain EO counts as a superhero. He was more a sci-fi space captain. With weaponized music that could make his enemies dance. Captain EO was only shown in the Disney parks and was about 15 minutes in length. He was more a sci-fi space captain. With weaponized music that could make his enemies dance. Everything about that description makes me laugh. But...if someone is from a different planet, and by virtue of that, has "powers and abilities far beyond those or mortal men", and uses said abilities to battle evil and/or save the Earth (and/or other planets)...aren't they a superhero? If we go back to the original question at the top of thread regarding "the assertion that "The Black Panther" movie will be the first black superhero film", in the broadest sense Captain EO top trumps BP and the rest; however, despite having thrown him into the mix, I'm inclined to agree with Brian's view: it's not a full length feature and it is debatable as to whether he can truly be called a super hero or not. As a side note, and at the risk of turning this into a Captain EO thread, anyone else remember the 3D comic that Eclipse put out to accompany the film? Has anyone got it?! Sorry to jump on this, but this has become one of my leading pet peeves, internet-wise. Matthew Wilkie, I had the Captain EO comic in the past year, but I have sold it since then. In truth, I read the post quickly on my phone and missed the "about". Point taken. Is it worth very much? I always found those Eclipse 3D comics impossible to read and pretty unspectacular 3D wise. The comic typically fetches between $5-$8.